We have vacationed in Panama City Beach for over 50 years. 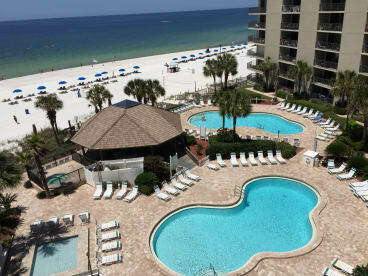 We love the beautiful beaches and the numerous activities available in the Panama City Beach area for our grandchildren as well as our children and ourselves. We purchased our condo at the Summerhouse (610B) in 2001 and have truly enjoyed this paradise as our home away from home. We were attracted to the beautifully landscaped pool area and the large gazebo, which provides picnic tables and chairs, with a great view of beach and ocean. Having two pools (one heated) available for our four grandchildren was also a deciding factor. The Summerhouse is a family friendly resort with a great staff. The Summerhouse manages our condo giving our guests 24/7 service; however, in order to rent, please contact me by phone, text. (205-613-3555) or email (sprescott2678@yahoo.com). Maintenance is available on-site if needed. For your convenience, beach chair service is included with the rental.